Stunning home, 5 bedrooms, 3.5 baths, near ocean, pools, tennis, sleeps 10 . This stunning family-oriented house located in the prestigious Bayside Resort Community in W. Ocean City, MD., near the ocean with gorgeous views of the Sinepuxent Bay, Assateague Island, the Atlantic Ocean, and miles of unobstructed fine, white sandy beaches. The house has been kept in pristine condition and boasts five bedrooms, 3.5 bathrooms, formal living & dining rooms with top of the line; furniture and high-end finishes and a large family room with TV where you can enjoy a movie or show. The spacious gourmet kitchen is fully stocked and the dinette and breakfast bar areas will be certainly a popular spot for you and your guests. Unwind with a drink and a good book on one of 2 porches or at the large flagstone patio. The washer/dryer is located on the 2nd. floor. The Bayside Clubhouse features in/outdoor pools with gazebo, state-of-the-art fitness center with T.V., bathrooms with showers, game room, grand-social room with WI-FI, TV, and kitchen, indoor/outdoor pools, game room, gazebo, tennis & basketball courts; tot lot, nature trails, crabbing pier, fishing ponds, and kayak dock. Ocean City offers something for everyone and it's only a few minutes drive to Assateague National Seashore (the home of the wild ponies/horses and Ocean City famous boardwalk and beach. Close to Frontier Town Park water and sports, the outlets, Malls, churches, grocery stores, pharmacies, movies, golf, restaurants, water park, marina, parasailing, jet ski, kayaking, deepsea fishing, put-put golf, many recreational activities & miles of sandy white beaches. - For the children: Camps for the following - Boogie Board, Skateboard, Tennis, Basketball, Lacrosse, Soccer, Cheerleading, Baseball, Inline Skate, and Dance. - For nature lovers, Assateague Island is nearby, a natural treasure of barrier island life featuring Assateague's famous wild ponies wandering the beaches and trails of the island! - For the family: water sports, nature tours, antique and outlet shopping, bay and deep sea fishing, restaurants. Ocean City is the perfect and relaxing family getaway. Make your vacation plans now! Call 301 651 7536 to check availability or for more details! - Just bring your sheets, pillow cases, bath & beach towels. Make this luxurious home your next vacation retreat! A place you'll bring your family and friends year after year. YOU MUST BE 26 YEARS OLD TO RENT. JUST BRING YOUR LINENS AND TOWELS. FOR YOUR CONVENIENCE linen Services : OCEAN CITY LINEN SERVICES (800 382-2742) AND OCEAN CITY BEACH LINEN RENTAL AT (800 422-2742) info@ocbeachandlienenrental.com. THIS IS A FAMILY ORIENTED RESORT BAYSIDE HOMEOWNER'S ASSOC., WILL NOT APPROVE HIGH SCHOOLS OR COLLEGE RENTALS. ONLY ADULTS OVER 26 CAN APPLY. PLEASE INCLUDE YOUR TELEPHONE NUMBER WHEN INQUIRING. Weekly rates as specified - $175 cleaning; $125 clubhouse fee and 10.5% tax. The area is so peaceful and serene yet so close Assateague the home of the wild ponies where you see them roaming in their natural habitat, miles of white sandy beach, historic Ocean City Boardwalk, water park, over 18 golf courses, Sunset Marina about 2 miles away, where you can dine, walk the marina, listen to live music and see the most beautiful sunset. Bayside resort clubhouse is a place where you can go and spend a whole day doing many activities, either relaxing by the pool, exercising at the state-of the art fitness center, indoor pool, or playing pool, video games or foosball. 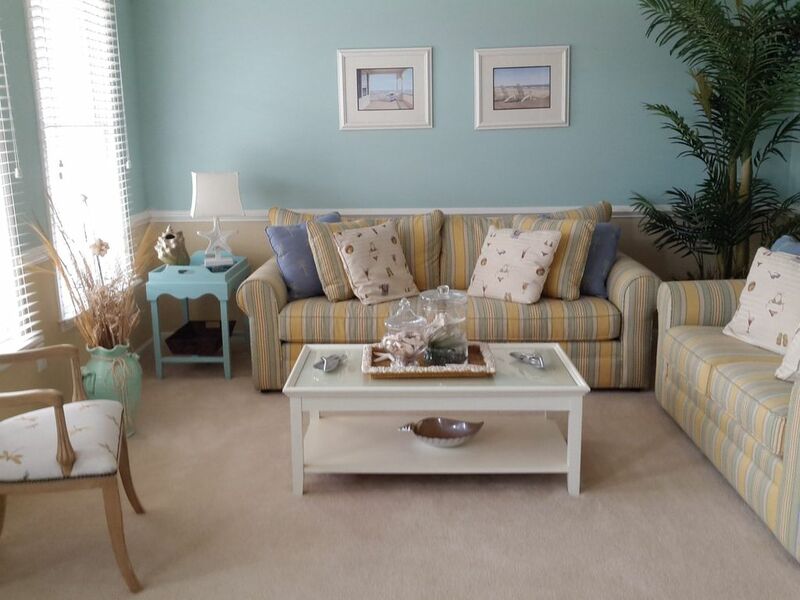 This is a gorgeous house, professionally decorated located in the Resort Community of Bayside. The resort is equipped with many ammenities, walking trails, fishing ponds, kayak dock, crabbing pier and beautiful views of the bay. The house has a large patio a place where you could sip your morning coffee or just relax. The balcony is located in the blue room and is another place where you can sit in the morning and relax or at night watching the beautiful sky. Right outside the living you can walk out to the large porch relax, read a book or just have a drink. This house is located in the prestigious resort community of Bayside with 4 bedrooms plus loft, or 5th bedroom, 3 1/2 bathrooms and laundry room on the second floor. The master bath has beautiful tile floors, double sinks and Roman tub and separate shower. The second bathroom has double vanities, with a toilet, tub/shower. The third floor has a large loft with full bathroom, tub/shower, sink, toilet and is very spacious. On the first floor, there is a formal living and dining rooms, gourmet kitchen, breakfast bar, family room with fire place, informal dining area, bar stools and the powder room. From the family room you can walk-out to the beautiful flagstone patio . The house shows like a model home. AVAILABLE FOR LOCAL CALLS AND FOR THE HOUSE ALARM!! Owners DON'T PROVIDE LINENS. BRING YOUR OWN LINENS, SHEETS, COVERS, PILLOW CASES. THE BEDS ARE PROTECTED WITH MATTRESS PADS, AND THE PILLOWS HAVE PILLOW COVERS. THE COMFORTERS ARE FOR DECORATION. Driveway and inside the community. WIRELESS INTERNET at the house and WI-FI at THE CLUBHOUSE COMMUNITY/SOCIAL ROOM. No Towels are provided. Tenants needs to bring beach towels; bath towels, wash clothes. Will provide linen rentals phone number. BEAUTIFUL DECORATED LIVING ROOM. SOFA AND LOVE SEAT AND CHAIR. COFFEE TABLE AND END TABLE. SEPARATE DINING ROOM SITS UP TO TEN. BREAKFAST BAR SITS SIX PEOPLE AND DINETTE AREA SITS SIX. COMCAST IS THE CABLE COMPANY. PLENTY OF BOOKS TO READ. PLEASE RETURN THEM BACK. BEAUTIFUL TREES AND GARDENS, THE LAWN HAS IRRIGATION SYSTEM. LARGE PATIO WITH ADIRONDACK CHAIRS. BALCONY/PORCH ON 2nd. BEDROOM AND ON THE FIRST FLOOR. kAYAK DOCK IN THE COMMUNITY ONLY A FEW HUNDRED FEET. RENT THEN NEAR BY THE COMMUNITY. VERY LARGE STONE/CONCRETE WITH BEAUTIFUL TREE ALLOWING LOTS OF PRIVACY. Rental just about 1/2 mile from the house. TENNIS AND BASKETBALL COURTS A FEW FEET FROM THE HOUSE. Over 19 golf courses, one about 1/2 mile from the house. The gourmet kitchen has recessed lighting and is equipped with all cooking and eating utensils. Beautifully decorated family room with a fireplace and ceiling Fan. The kitchen nook has a dining room table that seats six and six bar stools. The formal dining room has an elegant glass table with six chairs. The club house is beautifully decorated with bathroom, state-of-the-art fitness center, playground, tennis court, game room, indoor/outdoor pool, TV, pool table, games, full kitchen and Internet accessible. An amazing home and beautiful resort area!!! This home was beautiful, fully loaded with anything you would need. The common area of the resort was also amazing. The pool area and recreation area were beautiful!! The owners were very accommodating and great people!! We had the best family vacation. Thank you!!!! Dear Dawn, it was a pleasure accommodating your lovely family! We thank you for your gentleness and care of the house. It show great respect and speaks volume about you and your family. We are so glad you made great memories of your vacation. We hope to see you back. Again, thank you! My family and I (seven adults and a three-year-old) really enjoyed our time at this wonderful home in Bayside community and look forward to returning. Cecilia and Enrique are extremely nice and accommodating and we had absolutely no unpleasant surprises. Kitchen and downstairs was great, beds were of good quality and very comfortable. From the first turn of the key it was obvious that the owners really take pride and care for this home- personally which makes a huge difference. Our grand daughter and us loved the pools, great beaches, in addition adults enjoyed the tennis courts, near by golf, and restaurants. Add in a weather perfect week and we really couldn't have asked for more other than not having to leave. Thank you for submitting your kind review. We loved having you and your lovely family as our guests. We thank you for being so restpectful and gentle with our home, it shows respect and speaks volume about you and your family. Hope to see you return to Bayside. A beautiful home, well maintained in a quiet neighborhood. Easy walk to the pool. Ten minutes from two beaches. Several restaurants and grocery stores within minutes from the house. It was a pleasure having you and your lovely family as our guests. We thank you for your gentleness in which you cared for our house. You will be one of our favorite guests. Again, thank you. This house was spotless. Cecilia was wonderful to work with. It was perfect for our family. Great location, it fit all our family needs. We can't wait to return next year! It was a pleasure having you and your lovely family as our guests! We appreciate your gentleness and care; thank you so much! Looking forward to accommodating your summer vacation in 2018. My best to the family. Impeccably maintained house - clean, bright, and spacious...the photos don't do this place justice! Quiet road, peaceful surroundings... Pier overlooking the bay is less than five minute walk and is beautiful at sunrise. The pool was terrific for little kids after a day at the beach. Cecilia and Enrique could not have been any more pleasant or easy to deal with, and they were extremely responsive to both our pre- and post-visit inquiries. Finally, the location is outstanding - 15 minutes door-to-door to either Ocean City or Assateague, so there is the best of everything. I 100% recommend this property! Thank you so much for your kind review and appreciate your sincere comments. It was also a pleasure meeting you and your lovely family. We are pleased to hear you and the family enjoyed the house and the resort and hopefully you went home relaxed and with fond memories! We are very grateful for taking such good care of the house, it shows respect and speaks volume about you and your family. Thank you! You will be in our list of preferred guests and will rent to you without any hesitation. We wish you a great rest of the summer! This house is very clean and well kept. The house is very spacious and can accommodate a large family with all the bedrooms and bathrooms. It is in a very quiet neighborhood. It was perfect if you just wanted to relax and take a leisurely walk in the morning or a short drive to Assateague or Ocean City beaches. Enrique and Cecilia were very welcoming when we arrived and also when we were ready to leave. They are wonderful people to talk to. Thank you very much for another great vacation week! This house is highly recommended! Thank you so much for your kind review. It was a pleasure having you and your lovely family back this year. We are glad you had a great vacation and went back home relaxed and with fond memories! We like to express our gratitude for treating our house with gentleness and care, it shows respect and speaks volume about you and your family. You will be in our list of preferred guests. Our best to the entire family. Golf: Golfers' Paradise - Ocean City has become synonymous year-round for golfing and is home to nationally recognized, world-class courses with almost 20 championship courses. Eagle's Landing, River Run, Links at Lighthouse Sound was voted one of the top ten best new public courses in America by Golf Digest, as well as one of the top five in Maryland.There's the Santa Open in December at River Run Golf Club and the Celebrity Classic at Eagle's Landing. Every June and July your children can enjoy a 4 or 5 day programs at River Run or Eagles Landing Golf Camp. Enjoy the traditional Bay Club and Beach Club -- and try the Bay Club's new East Course. Read about Eagle's Landing, Links at Lighthouse Sound, Baywood Greens, and more in Golf Digest and Golf Magazine! Prepare to tame the new Bear Trap Dunes, featuring 27 championship holes -- designed by Rick Jacobsen. The Links at Lighthouse Sound was voted one of the top ten best new public courses in America by Golf Digest, as well as one of the top five in Maryland. On 1,000 acres overlooking the Ocean City skyline and St. Martin's River, the course features marsh, river, and bay. Experience the longest cart bridge in the U.S. Ski: water ski rentals near by. PLEASE NOTE MEMORIAL DAY RATES NO HIGH SCHOOL OR COLLEGE WEEK RENTALS YOU MUST BE OVER 26 YEARS OLD Resort Fee: $125 Tax: 10.5% Refundable Security Deposit: $500 Reservation deposit: $800 Bring your own towels and linens or rent them from linen service in OC. . NO HIGH SCHOOL SENIORS OR COLLEGE STUDENTS. Cashier's Check, money orders and checks are accepted. Rent is from Saturday to Saturday Check-in after 4 p.m. and check out is before 10 a.m. WE RENT TO FAMILIES OVER 26 YEARS OLD, NO GROUP RENTALS. NO SENIOR WEEK OR COLLEGE STUDENTS RENTAL. NO PETS.